With profound regret, I must announce to the members of the Battle of Midway Roundtable and to all others who may have an interest: the nation, the Navy, and the Roundtable has lost one of their best. Clay Fisher passed away on the third of January 2012, at the age of 92 years and eleven months. It wouldn’t be quite adequate to say that Clay was merely a key member of the Roundtable. He was that to be sure, but his ongoing and generous participation with us, offered from the rare vantage point as a dive bomber pilot in the thick of three days of action at Midway, has constituted a major piece of the total body of knowledge about the battle that the BOMRT has generated throughout its 15-year history. It would be tough to imagine the Roundtable without him. We would know a whole lot less about the USS Hornet air group and its controversial commander, both during as well as before the battle. We would know a whole lot less about flying and fighting in the SBD Dauntless. And we would never know his personal story of dedication, valor, and sacrifice in some of the most famous battles of two wars. A couple of those near-tragedies had a humorous ending, recounted long ago on the Roundtable and in our book about the Roundtable’s veterans, No Right to Win. The first one, before the war as the Hornet was moving into the Pacific from the Atlantic, involved a rough landing aboard the ship in an SBC4 biplane bomber, an aircraft with a poorly designed tailhook assembly. No one really knew that until the one on Clay’s plane ripped completely off as he caught a wire upon landing, sending the rest of the bomber skidding hookless across the flight deck until it came to rest amidships, to the amusement of a large audience of officers watching from the island. The second one, during training in an F6F Hellcat toward the end of the war, involved a dead engine, a ditching in the Atlantic, a rescue by sailors who gave the exhausted pilot a generous bolt of whiskey to help him recover, and finally a wide-eyed wife as her tipsy husband walks in their front door in a wet flight suit and dragging a parachute harness. However, there was precious little humor in many of his other sorties. He had a key role in the Hornet air group’s infamous “Flight to Nowhere” as the air-sea battle at Midway commenced on 4 June 1942. Flying as wingman to the group commander, Stanhope Ring, he had a front-row seat to the events of that curiously abortive flight—a story told extensively over the years on the Roundtable. And that put him in the center of the subsequent controversy that developed concerning which way Ring’s planes flew that morning. An abundance of veteran testimony suggests that the course was critically wrong and blatantly at odds with that recorded by the Hornet’s captain, Marc Mitscher. But virtually alone on the other side of the debate, Clay remembered with total clarity a scene during that flight that seemed to prove inarguably that the new theory, despite its host of supporters, had to be wrong and Mitscher had to be right. That’s a familiar story on the Roundtable, and you can find the full details in Chapters 8 and 12 in No Right to Win, with additional followup on our web site here. But the “Flight to Nowhere” was immediately followed that afternoon and over the next two days with four more sorties against the Japanese fleet, culminating in the final attack against a cruiser-destroyer force on June 6th, during which Ensign Fisher planted his bomb squarely on the stern of the destroyer Arashio. He and his radioman-gunner, ARM3/c George Ferguson, thus became one of the minority of aircrews who flew on all five missions against the enemy ships at Midway. There is far more to Clay’s World War II story, but it’s readily available in his book and in our on-line archives. For this obituary there’s only one more wartime tale that should be told, concerning his combat tour in Korea. Actually, he wasn’t supposed to go there at all. As a senior officer and World War II veteran who had already amassed his share of combat experience, he’d been ordered to an east coast squadron in 1950, which would have kept him out of the Korean war altogether. However, he’d acquired some personal interests in California that he wanted to attend to, so he requested a change in his orders to something on the west coast. That request was granted, and he was sent to the USS Essex (CV-9) at San Diego—briefly. It was soon bound for Korea and another shooting war. There he participated in the celebrated attacks on the bridges at “Toko-Ri” as well as numerous interdiction missions in North Korea, flying F4U Corsairs in the fighter-bomber role. After Korea he served tours in training squadrons at Pensacola and Imperial Beach, California, followed by his final assignment in 1960 as executive officer at NAS Miramar, near San Diego. 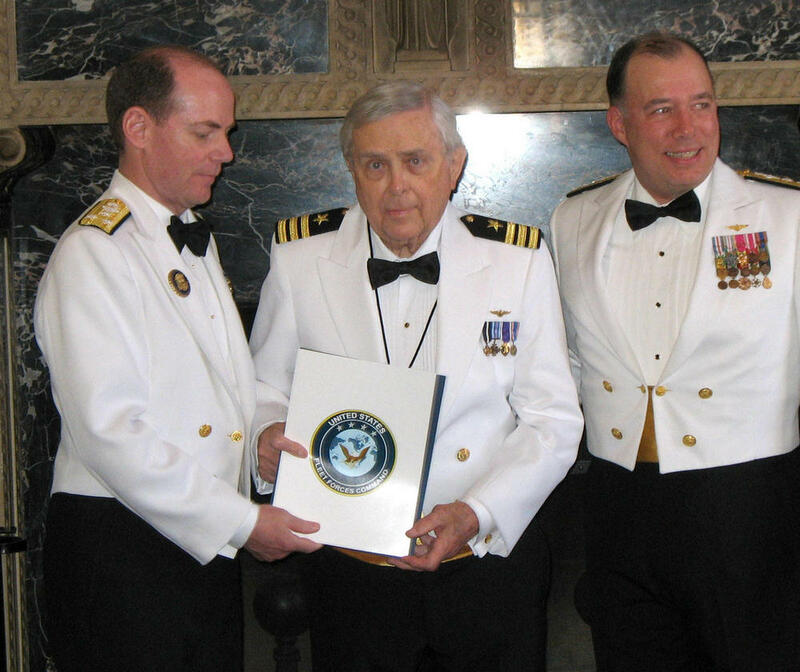 There he was amazed one day to find that a sailor named “Ferguson” was asking to see him—it was his radioman-gunner from Midway, George Ferguson, now a Chief Radioman. The two had a raucous reunion at the base CPO club. Clay retired with 21 years of service in March 1961, making his home at Coronado on the west side of San Diego Bay. He then commenced a long career as a real estate developer, which he told me was just slightly less hazardous than aerial combat. I first made contact with him in 2001 while seeking some information about the SBD Dauntless. We subsequently developed a close association by phone, e-mail, and in person over the next several years. I got to know him as one who, despite his advanced age, was exceptionally bright and articulate to his very last days, always willing to discuss in detail anything you’d want to know about the BOM, the Hornet, the planes he flew, and the men he served with in that fascinating era.